If you are in the market for a versatile new vehicle, then the chances are great that you are considering a new crossover. Toyota's RAV4 compact crossover continues to be a hit with car buyers, and the latest version, the 2016 Toyota RAV4, is now available. The RAV4 name has represented versatility at an affordable price for over two decades now, as it was one of the pioneering crossovers -- before that term was even coined, in fact. The RAV4 crossover is capable of up to 31 miles per gallon, while the RAV4 Hybrid model is even more fuel-efficient, at up to 34 mpg! Drivers near New Orleans, Mandeville, Covington, and the surrounding area can explore the RAV4 or RAV4 Hybrid at Toyota of Slidell in Slidell, LA. Our helpful team of Toyota sales experts will introduce you to all of the latest features of the Toyota RAV4; you can even take one out for a test drive! Find your new 2016 Toyota RAV4 in Slidell at Toyota of Slidell. Every 2016 RAV4 compact crossover is equipped with Toyota's efficient 2.5-liter inline-4 engine, producing a highly capable 176 hp and 172 lb-ft of torque. The 2.5-liter engine's Dual Variable Valve Timing with intelligence (VVT-i) technology helps maximize performance while boosting the RAV4’s fuel economy, too. A 6-speed electronically controlled automatic transmission with intelligence (ECT-i) is paired with Toyota's 2.5-liter engine to provide smooth shifts and effortless acceleration at all speeds. Standard front-wheel drive (FWD) provides excellent fuel efficiency and grip, while the available all-wheel drive (AWD) system with dynamic torque control is a popular choice for drivers who want added control and confidence in all driving conditions. Fuel economy figures range from an EPA-estimated 24 miles per gallon in the city and 31 mpg on the highway for RAV4 2WD models to 22 city/29 highway mpg for RAV4s with AWD. For even greater fuel efficiency while behind the wheel of a new RAV4 compact crossover, drive the RAV4 Hybrid. The RAV4 hybrid is one of the few hybrid small crossovers available today and features a 2.5-liter inline-4 hybrid engine, with All-Wheel Drive with intelligence (AWD-i) as standard. The RAV4 Hybrid returns up to an EPA-estimated 34 mpg in the city and 31 mpg on the highway, which rivals the efficiency of many smaller cars! The RAV4 Hybrid's EV Mode even lets you operate solely on battery power under certain driving conditions. To test drive the RAV4 or RAV Hybrid crossover near Slidell, LA, visit Toyota of Slidell. Keeping you and your precious cargo as safe as possible is critical to Toyota, that is why the RAV4 compact crossover is outfitted with a wide array of safety features. For instance, every RAV4 comes standard with eight airbags that can surround the occupants in the event of a collision. The eight standard airbags include Toyota's driver and front passenger Advanced Airbag System, driver and front passenger seat-mounted side airbags, front and second-row Roll-sensing Side Curtain Airbags (RSCA), and even a front passenger seat-cushion airbag and driver knee airbag. Toyota's Star Safety System™ is also standard on every new RAV4 and includes such features like Electronic Brake-force Distribution (EBD), Smart Stop Technology, and Brake Assist (BA). Available safety technologies like Rear Cross-Traffic Alert (RCTA) and Blind Spot Monitor (BSM) help detect vehicles that you may not see when backing out of a parking space or changing lanes; the systems can notify the driver of the presence of unseen vehicles with an audible or visual alert. If you live near Slidell, LA and would like to drive a highly versatile and fuel-efficient new compact crossover, then come and see the 2016 Toyota RAV4 at Toyota of Slidell. We proudly serve drivers near New Orleans, Mandeville, Covington, and the surrounding area. On top of our large selection of new Toyota vehicles, we have an on-site Toyota certified service center that will keep your Toyota running like new long after your purchase. 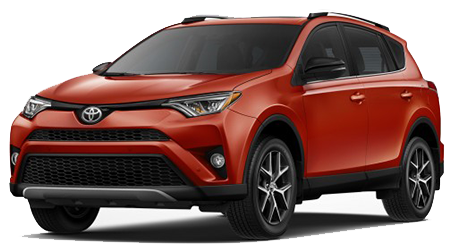 Visit our dealership today for a test drive, or browse our current inventory of new RAV4 compact crossovers and other new Toyota vehicles right here on our website. While on our website, you can also get pre-approved for your new car loan, value your trade, schedule auto service, and much more.